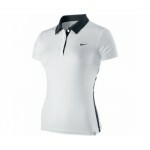 LT080 Lotto Tennis Polo Sl Share Ladies. Classic ladies technical tennis sleeveless shirt, featuring contrasting self fabric collar, arm cuffs and side vents. Stylish slim-line two button placket opening. Two shaped side panel inserts to provide a comfort fit and contrasting Lotto logo on left chest. A versatile lightweight soft-touch polyester with fast-dry properties offering extreme comfort.